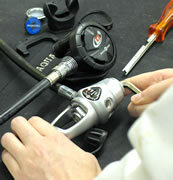 At Midland Diving our technicians have years of expertise servicing Regulator first and second stages, additionally offering cleaning for Nitrox/O2. 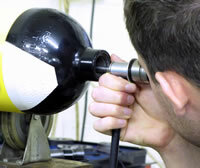 The MDE regulator servicing facility utilises professional simulation and diagnostic equipment, including an Ansti Computerised Surface Test Facility. Service work for both retail and trade customers is welcome. Please contact our service department on +44(0)116 212 4262 for further details. Midland Diving provide in-house Hydrostatic and Visual cylinder inspections by Idest-certified engineers in accordance with EN1802, EN1968 and SITA CP2. Our Idest-approved test station (1X) offers capability to test steel and BS5045/3/C aluminium cylinders, and carry thread gauges for M25, ¾BSP, M18, 19.8 Taper, .715 Taper plus others. 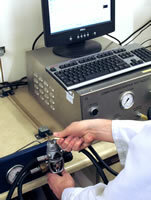 Other services include valve refurbishment and Nitrox/O2 cleaning of both cylinders and valves.